(Bloomberg Opinion) -- There's no way of telling what particular trades delivered a staggering 36.7 percent return last month for billionaire Alan Howard. But given that the hedge-fund manager’s track record was built on investing in fixed-income, you could do worse than rearrange the words "volatility," "Italian" and "bond" to form a likely answer. Howard's AH Master Fund, which he started in 2017, is up about 44 percent this year. Brevan Howard's main Master Fund, which is managed by a team of traders at his firm, has returned almost 9 percent this year, according to my Bloomberg News colleagues Saijel Kishan and Nishant Kumar. It's too soon to say whether that better performance will reverse the outflows that saw the firm's assets decline by 75 percent from their peak in 2013 to about $8 billion. But it would be odd if making almost 40 percent in a month proved to be a fluke. The return of volatility this year has been widely heralded as creating a friendlier environment for macro hedge-fund managers, whose returns have lagged benchmark stock indexes in recent years. In Europe, there may be a simpler path to making money: Betting that the European Central Bank's coming policy shift will finally shake government bonds in the region out of their torpor. "Fear of Missing Out" is typically used to describe investors chasing stocks higher without conviction that further gains are justified by company fundamentals. But the same epithet can be applied to the guardians of monetary stability. The Federal Reserve has made every other central bank jealous. By raising official interest rates several times, it's given itself elbow room to ease monetary policy if the economy nosedives. Its peers don’t have that luxury. And they're gagging to hike. That goes a long way in explaining the enthusiasm among ECB hawks for halting quantitative easing by the end of the year, so the central bank can get on with driving its deposit rate out of the negative territory it's been stuck in for the past four years. Last month's jump in the euro-region’s inflation rate to 1.9 percent, effectively meeting the ECB's target, is expected to be transitory. Economists polled by Bloomberg don’t expect the rate to push higher than 1.6 percent between now and September 2019. But that’s unlikely to deter policy makers from halting the government bond-buying program by December, something comments by ECB policy makers Jens Weidmann and Klaas Knot this week only underlined. 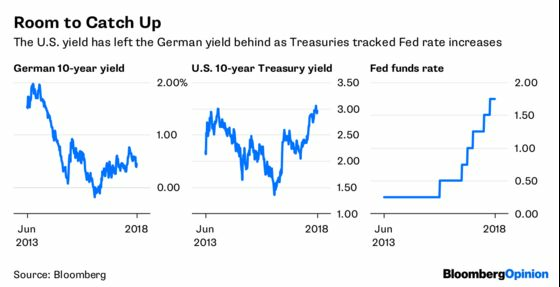 For sure, fund managers who've wagered that German yields will rise sharply in recent years have been burned. In April 2015, fixed-income guru Bill Gross described a bet against the 10-year bund as "the short of a lifetime." But a fall in prices in the two weeks or so after he made that call came much quicker than he had expected, contributing to a 2.6 percent loss in Janus Capital Group inc.'s Global Unconstrained fund. And in the month before Hugh Hendry closed his Eclectica hedge fund last year, he lost 3.8 percent, almost all of that due to a wrong-way bet on a rise in Germany's two-year yield, which remained stubbornly stuck at about -0.7 percent. In March 2017, Hendry said he had made a "substantial” bet that spread between the Italian 10-year bond and its German equivalent would widen. Back then, the gap was about 200 basis points; it's currently about 245 basis points and got as wide as 290 last week. The market could stay irrational longer than Hendry could stay in the game. 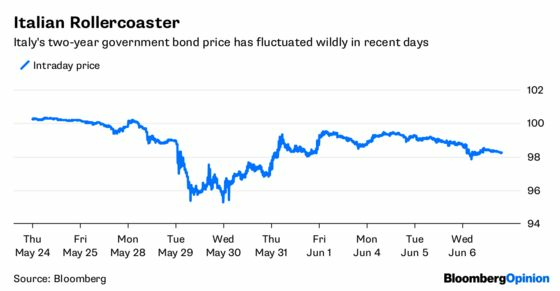 The surge that saw Italian spreads blow out in recent days was idiosyncratic, as investors demanded an extra premium to lend to a nation with a new, seemingly spendthrift government. But Wednesday's rise in euro government borrowing costs swept across the board, with even French yields rising by 10 basis points following the ECB board members' comments. 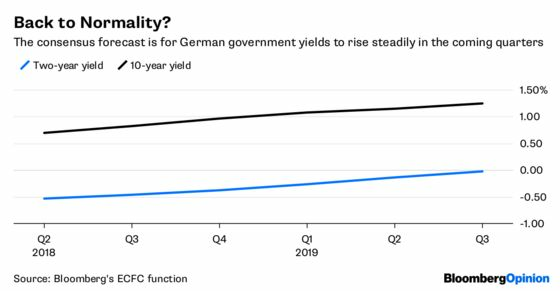 Economists are anticipating higher German yields in the coming quarters. A shift toward ECB policy normalization should shake euro-denominated government bonds out of the range that's seen benchmark bund yields trapped in a range between 0.2 percent and 0.8 percent for the past year — and that should hand more opportunities for profit to macro hedge-fund managers like Howard.